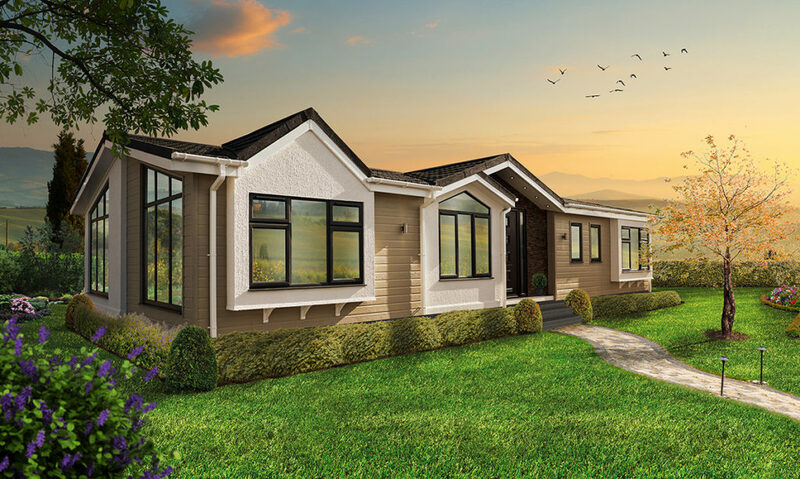 As soon as you walk in through the Delamere’s front door you get an idea of what this park home is about – luxurious living with innovative features at an affordable price. Next to the main door is your coat hanging area – not just hooks attached to the wall but an entire panel made just for this purpose. 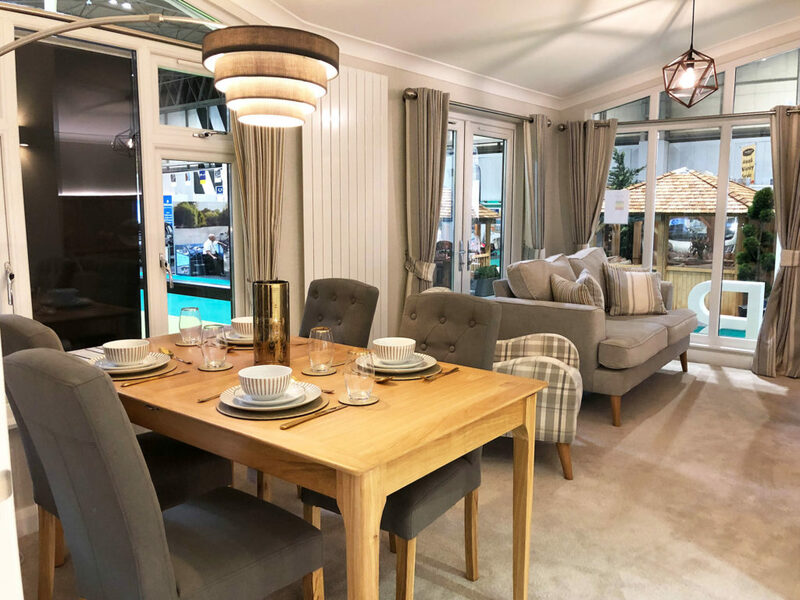 This theme continues throughout the Delamere, as everything has a purpose in this park home, using design features to enhance the living experience. 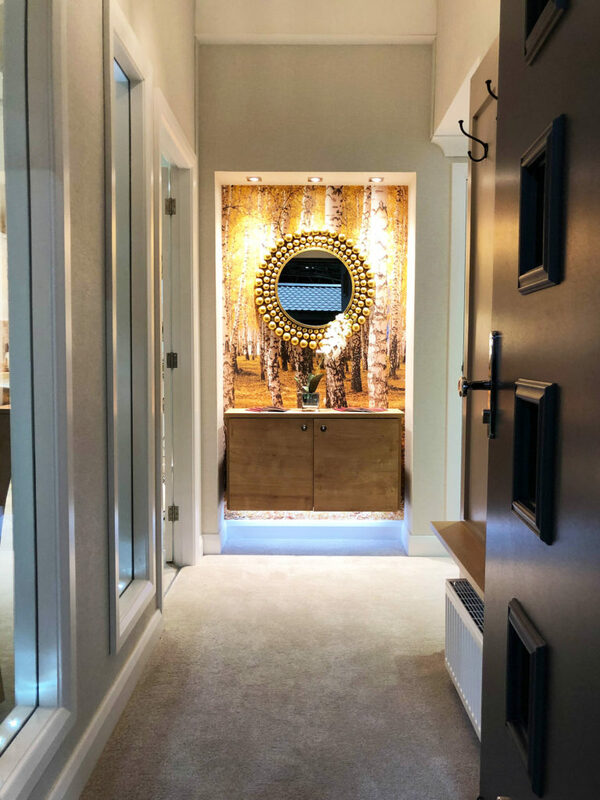 The feature wall in front of the main door is a welcoming and stunning entrance view – not only is it lit by inset lighting but it also has recessed LED lighting set into the base. To the left are the kitchen and dining room, with the lounge beyond. The kitchen is finished all in white with pale oak surface tops. Even with the bright white clean look it feels warm and inviting. The tiling in the kitchen is a marvel. 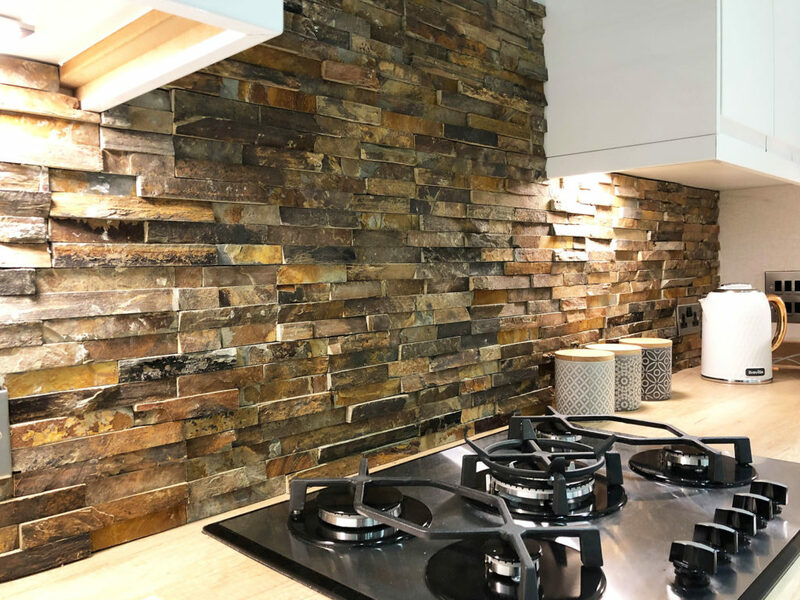 Strips of cut stone form the backdrop behind your five burner hob, it’s tactile and looks fantastic. 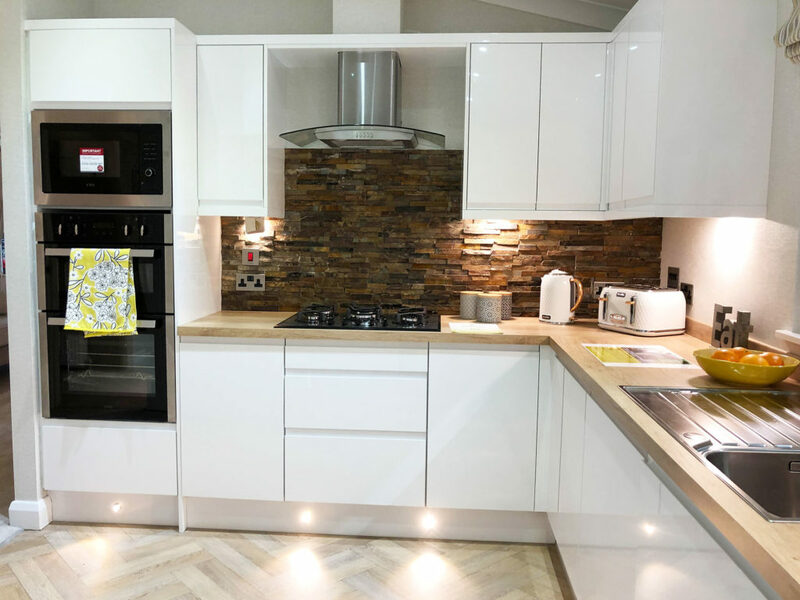 The kitchen appliances are laid out in such a way as to maximise the usable space. If two people are teaming up to cook the evening dinner there’s space aplenty for each to have their own station. Opposite the kitchen is the dining area, surrounded by windows and light, the glass panels next to the dining table and the front door have little LED lights set into the base – simply cool. Moving into the lounge, which is open plan with the dining area, there are more nice design touches. Recessed lighting lines a panel on one wall and the other walls made up mostly of glass. The sheer amount of light that can be let into the Delaware makes it a bright, airy and beautiful place to be in. It has a fireplace with faux log burner and double patio doors as well, to access your decking area. If you turn to the right as you enter the Delamere you move towards the sleeping accommodation side of the park home. 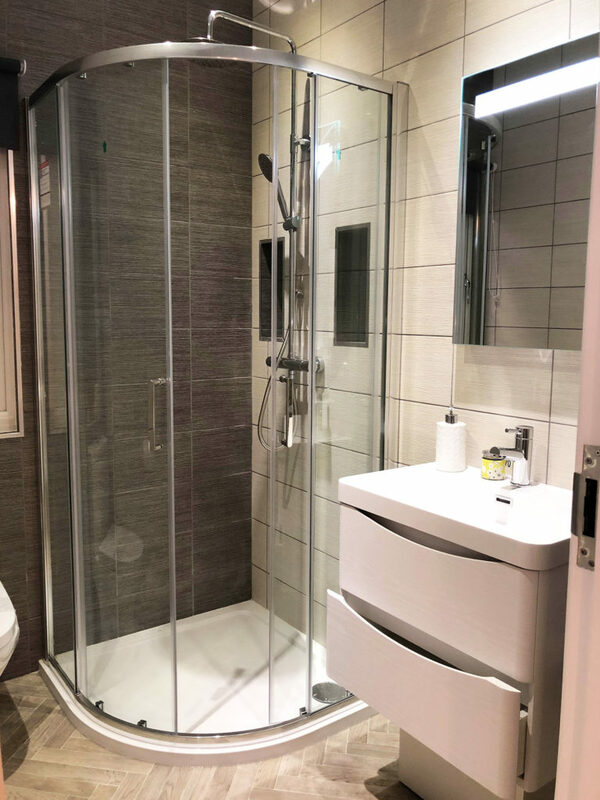 The master bedroom is on the left, complete with its own separate dressing room and en-suite, housing a huge corner shower. There’s a luxury feel here, without the luxury price tag! The second bedroom has a nearly full-length window above the bed head and another large window next to it, as is the theme in the Delamere, light abounds everywhere. This bedroom also has recessed lighting built into the bed head, giving a boutique feel, even in the ‘spare’ bedroom. 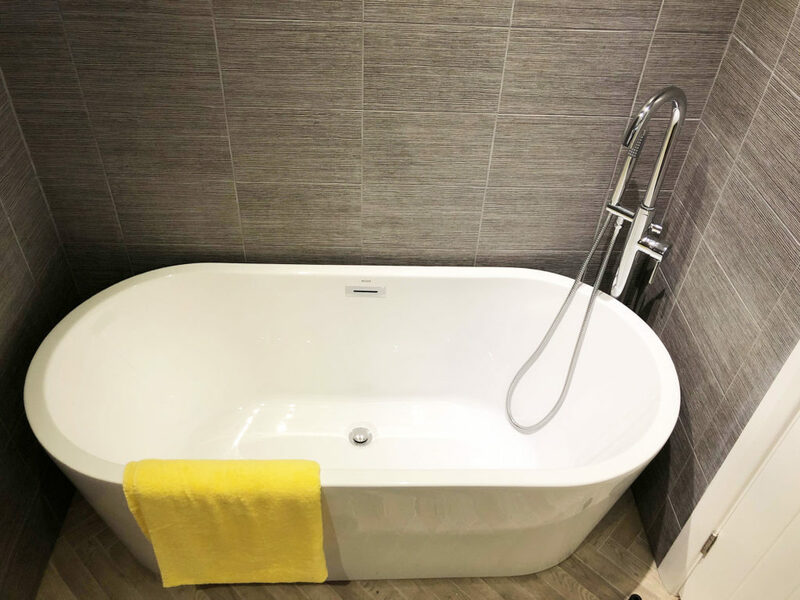 The main bathroom is opposite the master bedroom and features a freestanding bath and plenty of storage for all your ablution needs. The grey textured tiles and pale oak parquet flooring make it a warm environment, even without the need for splashes of colour. The fittings are also stylish, far from run of the mill, the Delamere exudes quality at every opportunity. 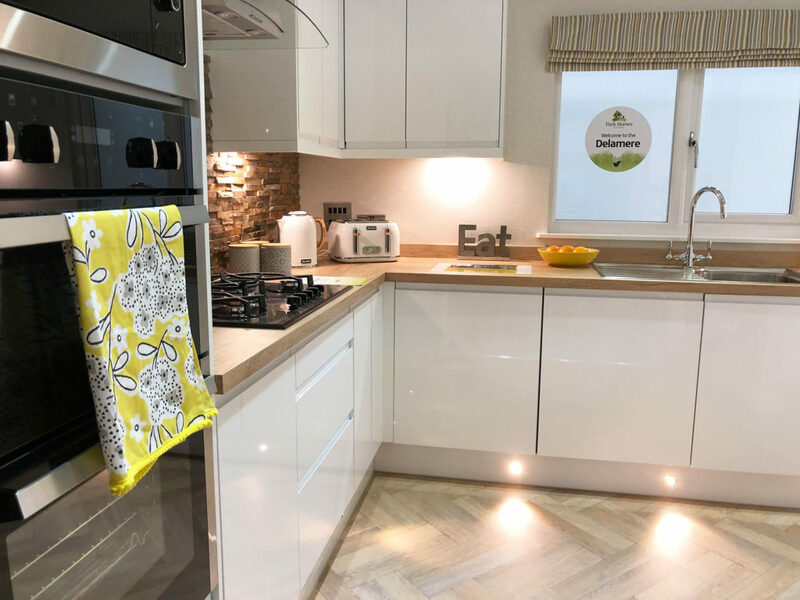 Verdict: Luxury park home living without the luxury price tag, the Delamere is stylish, clever and very well constructed. There is nowhere in this park home that you feel could do with improvement, everything is so well thought out. It doesn’t just exude style, it gives off confidence too! Plus: Great kitchen, open plan lounge-diner with more than enough light from every angle. Boutique bedrooms and high-end washrooms complete the Delamere park home. Minus: The master bedroom does feel a little enclosed but this is only the 40×20 model. 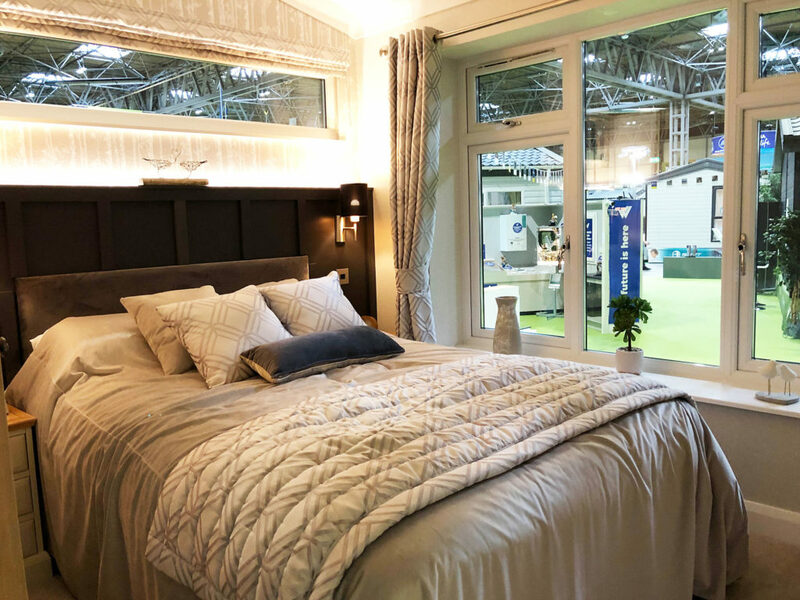 Willerby currently make this unit up to 55 feet long! No seating area by the door for the removing of muddy shoes and boots. 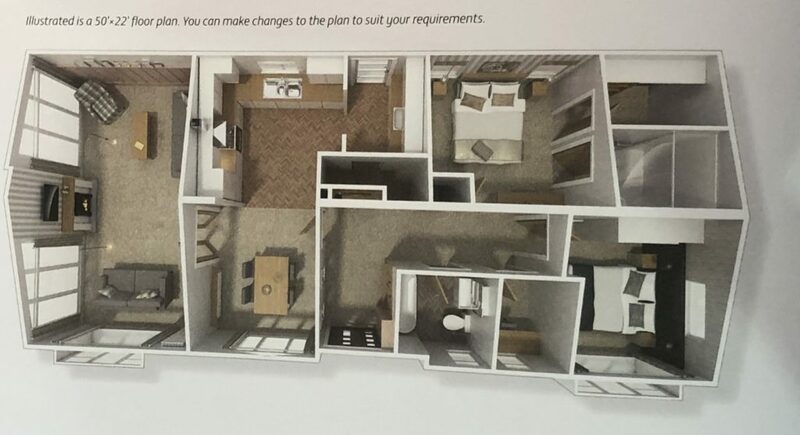 Key options: As this can have a bespoke specification, there are multiple options available for each room. For example, a Magnet kitchen upgrade is available. *Extra charges will be made by park operators, and/or distributors for transport, siting and annual maintenance. Please check the price carefully before you commit to buy, as prices vary considerably dependent, amongst other factors, on the geographical location of your chosen park. 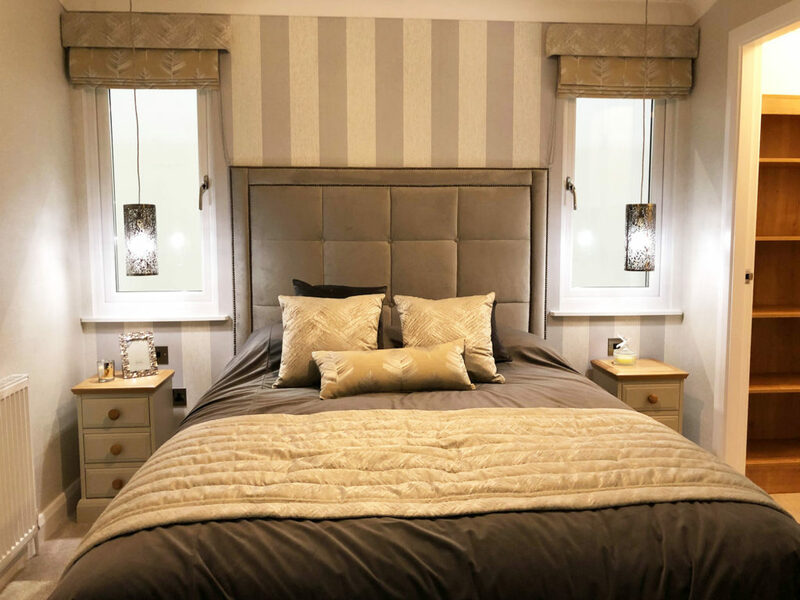 For more information on this park home visit www.willerby.com. 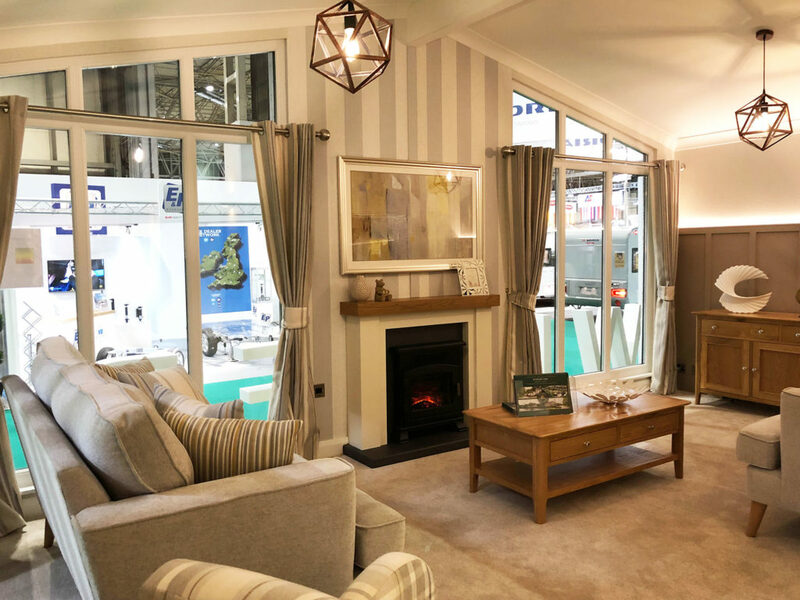 Click here to get more information about insuring your park home or call us on 01422 396 770 to get a great value insurance quote. Do you have a hot tub at your static caravan or lodge?